The current trend has been that just about everyone wants to cap on Stone. That's great, until we have too much of it. This defines the factors we want to look at for every resource when deciding what to collect. The number of resources we have is not the number we have collected, just because we use up some of those collected resources. Ideally, we will use all of our Charcoal, Metal Ore, Precious Ore, and later on probably Minions. Anything left over can't be used, therefore it goes to waste. Other resources (Logs, Stone, etc. can be stored to a certain point). Weekly Upkeep is about how many resources we NEED to keep the Citadel running smoothly. It's the #1 most important number to notice. We need to reach the Weekly Upkeep demands for every type of resource every week. In this case our Upkeep is only 50 Precious Bars. They go into our Tier 4 Storehouse Upkeep. For other resources, like Logs and Stone, the Upkeep numbers are generally higher. As we advance to higher tiers, we will need more Precious Bars for Upkeep. In the example above, the Weekly Upkeep has been met. 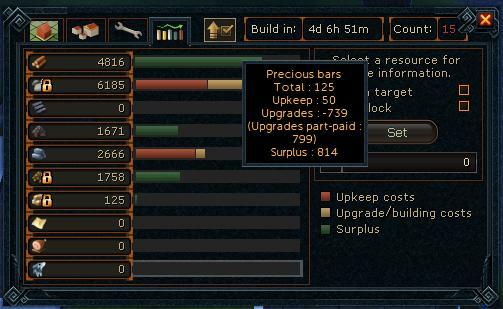 Upgrades is confusing, but what it's saying for Precious Bars is that we have collected 799 toward the Medium Avatar Habitat and 60 toward our upcoming tier4 Woodcutter plot (799 - 60 = 739). 1. 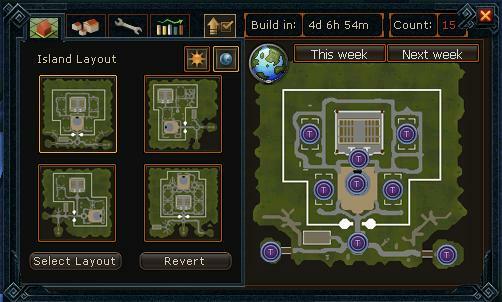 Collect enough of each resource to reach Weekly Upkeep requirements. Requirements change as we advance into higher tiers. It's worth checking them. 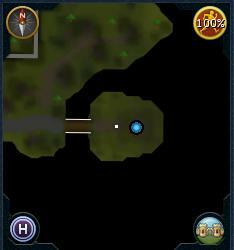 If we don't meet our Weekly Upkeep requirements, the Citadel can dilapidate and we could not only lose progress but lose our buildings. 2. Collect resources toward upgrades. Some of this may appear as surplus, but we want the upgrades. 3. Finally, collect resources into surplus. That way we have some stuff carrying forward into the next week.